In her article devoted to the 55th Venice Biennale, published by ” The Wall Street Journal” on June 18th, the art historian Barbara Rose writes about the Italian Pavilion: “Given that Italy is the host country of the Biennale , it is an insult to its artists that the management displaced them from their main pavilion in the gardens, crowding them into the most remote spaces at the end of the Arsenale to transform what was the Italian pavilion into the international exhibition curated keynote ( … ) “. 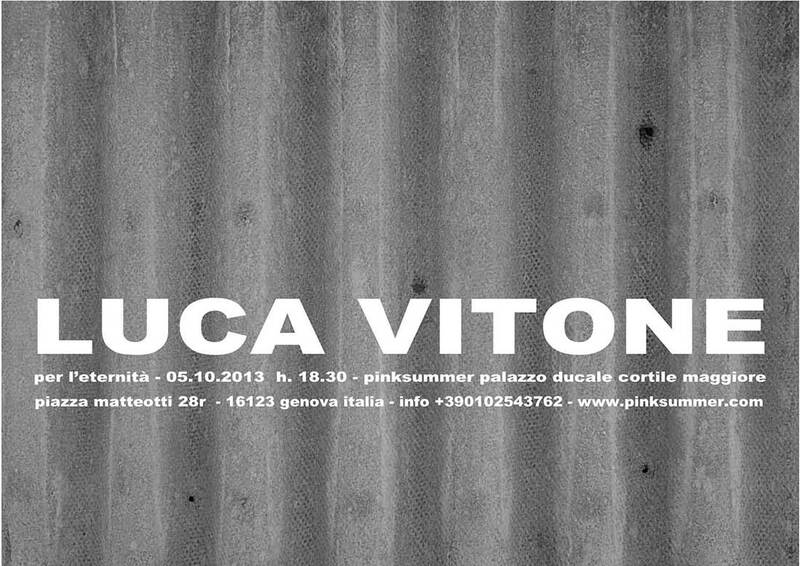 We have chosen this quotation to open the press release of Luca Vitone’s second solo show at pinksummer, an exhibition that shares its title with Per l’eternità, the achromatic and mono-olfactory sculpture based on rhubarb – or more exactly rhubarbs – created in collaboration with the master perfumer Maria Candida Gentile, that has thoroughly permeated the air of the Italian pavilion at the Venice Biennale and sometimes even its surroundings. The smell, dynamic and ambivalent, is considered by the artist an anamnestic portrait of Eternit, the versatile and odor-free building material, that, in spite of its name, coming from the Latin word aeternitas (eternity), has caused so much and too much death in Italy because of the inhalation of its fibrous minerals particles, especially in Casale Monferrato, where the Eternit plant was located. Hence the project’s title Per l’eternità (To Eternity) and the idea of ? ?creating an invisible piece after Luca Vitone’s previous reflection on monochrome painting, based on the gist of an anti-pigment made from those pollutant powders floating in the air, which are both material and formal cause of his paintings. On June 3rd of the current year, a few days after the opening of Venice Biennale, the Court of Appeal of Turin has sentenced the Swiss billionaire Stephan Schmidheiny, co-owner of the Eternit plant in Casale Monferrato, to 18 years jailing, together with Jean-Louis Marie Ghislain de Cartier de Marchienne, who died a few days before the judgment on May 21st in his villa in Belgium. The trial against the Eternit owners started in the Palace of Justice in Turin in 2009, following a class-action lawsuit after the death of about 3000 people, including citizens and factory workers, caused by the exposure to asbestos. At pinksummer, the kaleidoscopic approach performed by Luca Vitone with his project Per l’eternità will take the form of a very delicate video made of voice and landscape , in which the violence of a collective trauma is dematerialized in the words of a woman, who tells about her strange fear of the wind. The still and horizontal landscape seems like a face portrayed by the fixity of a thought, within which the thrill of life feels like a mere accident. The other main piece of Genoa exhibition is a monochrome that subsumes, almost as an antithesis to the delicacy of the video, the symbolically heavy clutter of a prematurely archaeological memory, made remote, sterile and somehow appealing by an appropriate material enclosure.We started this press release with Barbara Rose’s quotation from “The Wall Street Journal” to denounce how the lack of foresight of contemporary Italy is also present in the miserable support given by the country to its artists. Italy, a country which marginal political and cultural situation is clearly represented within the geographic microcosm sample of nations featured at Giardini and Arsenale by the Venice Biennale. Barbara Rose continues her article claiming that the marginal condition in which the Italian artists are presented, confined to the Giardino delle Vergini, is particularly unfortunate, considering that , according her personal judgment, one of the best installation of the entire Biennale is that of Marco Tirelli. Unlike European and non-European countries, that have always conferred to their national pavilion a symbolic value, metaphorically but also in terms of economy, not only as an investment but also as a profit, Italy and its curators does not tend to optimize the always scantier resources poured in the larger (Beatrice , Sgarbi) or smaller (Pietromarchi) pool of the group show. Bartolomeo Pietromarchi, the curator of Italian pavilion, to overcome the curtailment of ministerial funds for visual arts allotted to the Venice Biennale, has adopted a crowd funding strategy. The names of all the people who supported his exhibition “Vice-Versa”, according to the indistinctive way of collectivism, were mentioned on a board at the entrance of the Pavilion and on the catalogue. Those who have supported – and here we thank them again for their invaluable help – the curatorial project of Pietromarchi choosing to support the environmental installation of Luca Vitone were omitted in the crowd funding list, which democratically included 5 euro donors too, and marginalized by being mentioned in the caption of the work. A discriminating distinction that is indeed hard to understand. Also, the supporters of Luca Vitone’s project for the Italian Pavilion, except those who usually receive their invitation from the Biennale Foundation, were invited to the official opening of the exhibition just by the Latin American Pavilion, where Luca Vitone was admitted as requested by its curators who offered the production of one of his works. Sticking to the old Italian fatalism, we conclude by asserting that it could have been worse. AGI Verona; Francesco Berti Riboli, Genova; Dena Foundation for Contemporary Art, Parigi; Fondazione Sambuca, Palermo; Andrea Fustinoni e Fabio D’Amato, Santa Margherita Ligure (GE); Eva e Alessandro Nieri, Fucecchio (FI). Thanks to: Anna Maria Amato Falcone, Francesco Berti Riboli, Antonella Berruti, Gerardo Cejas, Fabio D’Amato, Paolo Falcone, Giorgio Fasol, Andrea Fustinoni, Roberta Garufi, Daniele Gasparinetti, Maria Candida Gentile, Marco Giammona, Rossella Giammona, Loredana Gintoli, Alessandro Nieri, Massimo Palazzi, Francesca Pennone, Eva Perini Nieri, Bruno Pesce, Giuliana Setari Carusi, Cristiana Stona, Angela Tenca, Gianni Villa, Maria Villa, Leo Vitone. In particular we thank contributors of the studio: Floriana Giacinti, Elvio Manuzzi, Giovanni Oberti.